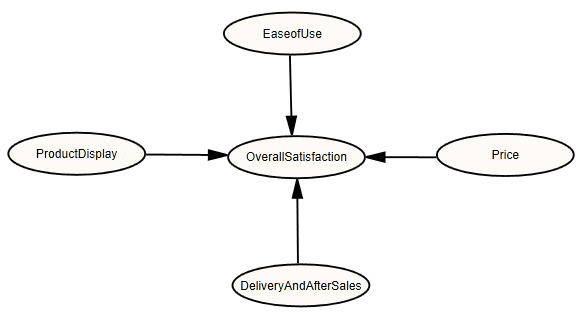 A Structural Equation Modelling Approach to Analyse Factors Affecting on-line Shopping Experience. To determine the critical factors which lead to overall satisfaction in on-line shopping experience an empirical research was undertaken with a survey questionnaire as the research instrument. The conceptual model portrays the following hypotheses which would need to be validated using structural equation modelling. The structural equation modelling would need the following latent constructs and the associated manifest/ indicator variables as given below. Payment options: Cash on delivery, Net banking, Credit card, etc. The manifest/indicator variables were measured from the survey responses to the questionnaire. 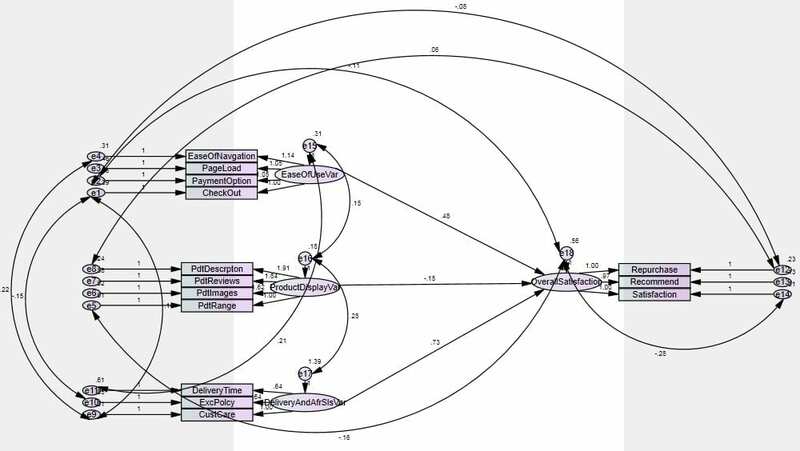 Structural Equation Modelling (SEM) is used to confirm the stated hypothesis of the conceptual model. The final sample size was obtained as 98, margin of error of 10%. To run a structural model as presented by the conceptual model, an online survey was designed to capture the responses of online shoppers. A database of 98 responses was prepared based on the data collected using survey. Cronbach’s Alpha reliability test was performed to check whether the stated indicator variables are able to measure the same construct. After reliability test it was found that ‘price’ was not being measured reliably by its indicator variables (price of product, shipment cost and coupons&discounts) as its Cronbach’s alpha value is less than 0.7. Thus the latent construct ‘price’ was not included in SEM. Figure 2: Revised Conceptual Model based on Cronbach’s Alpha values. Results from structural equation modelling. 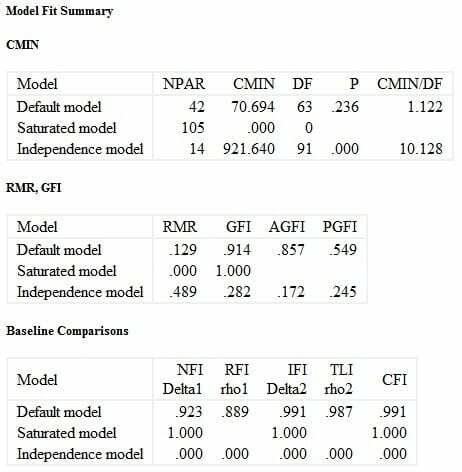 The model fit was good considering the values of CMIN/DF, p-value, CFI and NFI, we can now proceed to have a look at the estimates weights and their levels of significance. Quality of timely delivery and after sales significantly affect the overall satisfaction experienced by a customer while shopping online (Critical Ratio = 6.171 > 1.96, individual p-value is *** indicating highly significant). Ease of using an online shopping portal is positively related to the overall satisfaction experienced by a customer while shopping online. We can conclude this hypothesis but with caution (Critical Ratio = 1.909 < 1.96, individual p-value is.056 indicating somewhat significant relationship). Quality of product display is not positively related to the overall satisfaction experienced by a customer while shopping online (Critical Ratio = -.369 < 1.96, individual p-value is .712 indicating not significant relationship). The above observations are incorporated in the final model where solid lines show significant relationship dotted line indicates a relationship which is not significant. Thus from SEM analysis it was found that the below two hypothesis are correct. Figure 4: Final Model as seen in the AMOS output. Krunal Kantilal Patel is a student at IIM, Ranchi. He is currently in his second year of PGDM program and is pursuing his majors in marketing and operations and a minor in analytics. Krunal has worked for three years in data-warehousing and business intelligence division as a software engineer, at Fiserv Global Services, Pune and has completed his B.Tech in computer science and engineering from NIT, Jalandhar.